The way, what we eat affects our digestion and in the similar way where we sleep affects our body metabolism the whole day. A good sleep is the key to healthy living and mattresses are essential for a comfortable sleep. Whether you have purchased a new bed or just moved into your flat and awaiting your first furniture, mattresses are the first thing that you would need. Note – If you are looking for any customization from the size perspective you need to check with the seller if they are providing this facility. Shipping is free in most of the mattresses so you can easily place the order online. Wake-Fit Orthopedic memory foam mattress is undoubtedly the most preferred choice when it comes to selecting a mattress because of its excellent features in this price range. Wake-Fit is the only mattress manufacturing company which is offering 20 Year of warranty on its products. This is a memory foam mattress and memory foam are known for comfort. 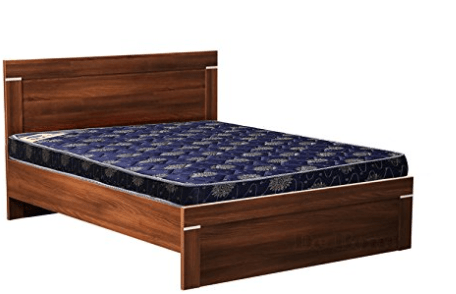 It does not push your body like spring mattress rather its foam absorbs your motions and maintains the proper grip on your body so as give you proper comfort while changing posture. 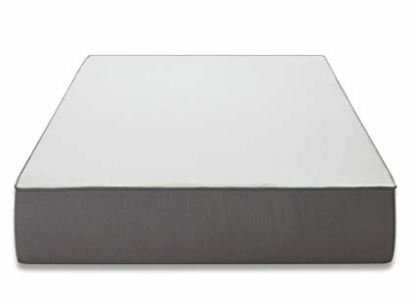 This Wake-Fit mattress comes with an additional orthopedic feature on top of memory foam feature. In Orthopaedic manner, it provides uniform support throughout by distributing body weight uniformly. Therefore it is very well suited for people having trouble with back pain. ● 20 Years Manufacturer warranty. Some mattresses are hard. Some are soft. Others are springy. Then there’s one that’s just right. 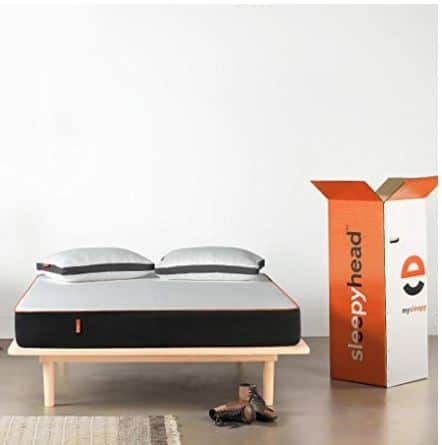 Sleepyhead mattress is one such perfect mattress for you. A medium- firm mattress, Sleepyhead is not only highly supportive but also rates highly on the softness that we all desire. Sleepyhead mattress offers comfort, support, and durability with its uniquely designed 3 layered structure. With the firm foam base, a memory foam in the middle and a breathable soft layer to top it off, Sleepyhead keeps you and your bedmate equally comfortable. Unlike a traditional mattress, Sleepyhead comes with a high-quality cover that you can wash regularly to keep your bed comfy and completely dust-free. Sleepyhead mattress is available in different sizes and if required you can ask for customization from the customer care. Bonded foam mattress is formed through re-compression of PU foam material under tremendous pressure. This prevents sagging of mattress which helps in the user having a comfortable and healthier sleep in the long run. This foam mattress is quite firm in nature. It is suitable to be used by the people who are back sleeper. If you are a stomach sleeper means prefer to lie in the bed with stomach down then this might not give you a comfortable sleep. Since it is formed through the recycling process so it is eco-friendly and also it is least expensive. This Euro dreams mattress is also good for the purpose if you are looking for back pain support under budgetary constraint. This Euro dreams mattress does not come with any removable cover so you need to use a good quality mattress cover to keep it healthy for long-term usage. Since it is lightweight, you can easily use it across different places as per your needs. 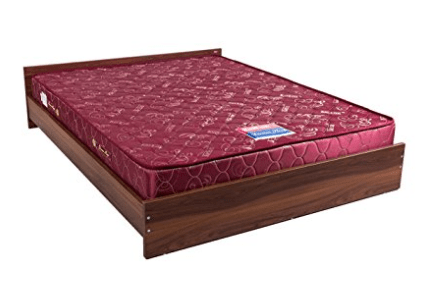 Kurl-on spring mattress is having rigid flexible comfort layers that offer the right support for your back without losing shape even on prolonged usage. It comprises of high tensile Bonnel spring with helical wire technology which adds bounce and provides more comfort. Along the Bonnel spring, Kurl-On mattress is having circular helical wire support that locks the springs and avoids movements thus keeping your mattress firm over a longer period of time. In addition to spring, Kurl-on mattress is having PU foam as side support comfort layer that helps in avoiding spring aging & maintains mattress shape unchanged. For a firm support, this mattress is having high-density cotton felt layers on top & bottom springs. This mattress is crafted to perfection with polyester jacquard weaving with anti-bed bug thread locked by web tape finish. Coir mattresses are specially made considering Indian home requirements. Made from coconut coir, these mattresses are renowned for their firmness. You can call this an eco-friendly mattress, free from any chemical substance. If you are habituated to use the firm base for sleeping then this serves as the most preferred choice. Its outer cover is made up of cotton fabric thus making the mattress durable. The three-layer material of the mattress adjusts with the surroundings and keeps the user comfortable in all weather. The mattress is anti-allergic and mite free. It is a combination of comfort, durability, and firmness, and is made up of the superior quality inner shell of premium quality active bond material using biotech technology. Note:- Proper care of coir mattress can significantly increase its lifespan. It is advisable to not to fold mattress. You should change the side of the mattress every 3-4 months. You can use it in a reversible way as well. This reduces degrading of coir. 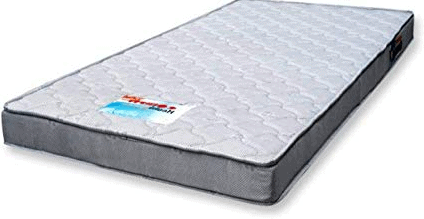 If you are looking for orthopedic support in case of back pain then Wake-fit orthopedic mattress serves your purpose well. Sleepyhead mattress is also recommended the product for anyone who is looking for something in between of highly firm and soft mattress. If you are looking for firm support you can opt for coir mattress. Coir mattress and bonded foam mattress are suitable for living room usages. Both mattresses are also advisable for usages at commercial places like shops.